$50 Kohl | A Savings WOW! Spring has officially sprung! 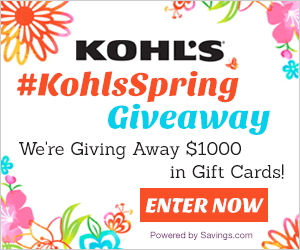 To celebrate, Savings.com is giving away $1,000 worth of gift cards to Kohl’s! Twenty (20) winners will receive a $50 gift card to Kohl’s! Join the #KohlsSpring Twitter party tonight at 9:00 pm ET. RSVP here and participate in the party for your chance to win $400 in Kohl’s gift cards!